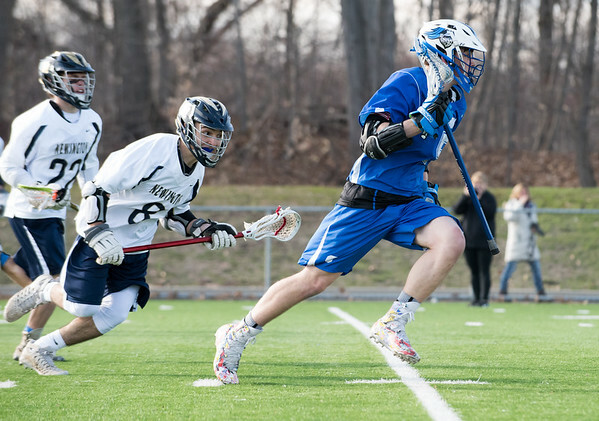 @NEWINGTON - Over the past couple seasons, a boys lacrosse matchup between Southington and Newington wouldn’t be much of a contest. On Tuesday, however, the Indians showed a much-improved program off in the 8-5 loss to the Blue Knights. It was a grind-it-out affair for both teams throughout and was anybody’s game coming down to the final four minutes. The Blue Knights took advantage of Newington at the end, though, with three consecutive goals to close it out. Welch put Southington up 6-5 with 3:43 remaining in the final quarter of play. Just over a minute later, Evan Johanns would capitalize on an Indians’ turnover at the other end as he put his shot past Newington goalie Jeajuan Ramos and quickly the lead was slipping away. Down two goals with 2:30 left in the game, the Indians needed a spark from somebody, but couldn’t find it as Southington’s Ethan Thomson put the exclamation point on the victory with his third goal, completing the hat trick. Those final four minutes proved to be the difference in a tightly contested game between the two. Newington got strong play out of its four senior captains in the game: Brennan, Mike Ganley, Matt Barron and Rob Petronio. Brennan and Ganley both scored. Ganley had the first goal of the game for Newington and Brennan stopped a two-goal Southington run in the third quarter with a goal. Petronio had six ground balls in the game as the defensive leader. Southington, playing with some inexperience on the defensive end, got a strong game out of goalie Garrett Brown. When the defense would miss their slides and give up open looks, Brown was there to stop it. He flashed his ability in net and made it difficult for the Indians offense to find any consistent offense. On the other end, Ramos also played a strong game for Newington. The play of the two goalies was a big reason behind the low scoring game. Ramos tried to match Brown save-by-save. With the win Southington moved to 3-1 on the season. Newington fell to 2-1. Posted in New Britain Herald, Newington, Southington on Tuesday, 10 April 2018 21:33. Updated: Tuesday, 10 April 2018 21:35.